Venezuelan refugees begin their journey at the border in Cucuta, and their first destination is Bucaramanga, the next large city. 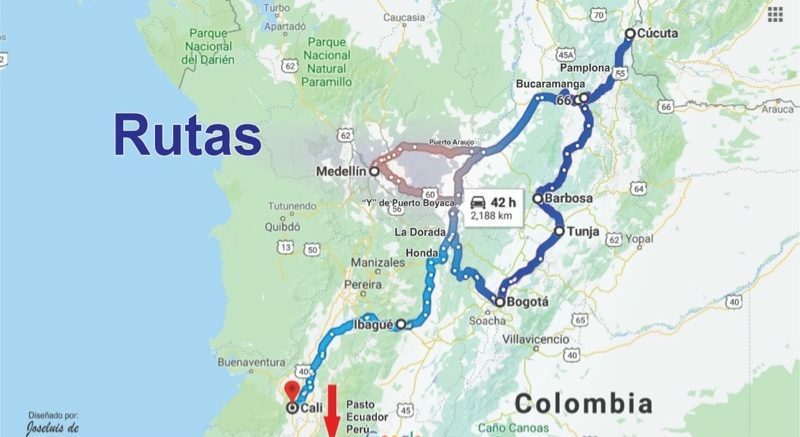 This stretch takes 4-5 hours by bus and costs about $10. On foot, the same journey take 6-7 days and includes climbing a pass of 12,000 feet. This difference in elevation means that temperatures vary widely through the journey. At the Venezuelan/Colombian border, average temperatures are in the mid-90s, and Venezuelans start the journey dressed accordingly. At the top of the pass, however, temperatures are in the mid-30s, sometimes dropping below freezing. By the time the walkers reach the top, most are extremely dehydrated, malnourished, and not prepared for the cold. A number of Venezuelans have died from exposure along the side of the road, often children. This exhausting and sometimes devastating hike uphill, as well as the months of malnutrition and struggle preceding their journey, have given the walking Venezuelans a haggard and hunted look. Their shoes are falling apart. Their backpacks are ragged and torn, or have lost zippers. Their eyes are sad, sometimes bloodshot. Their walk is slumped and weary. Many of them are also very thin, matching statistics on Venezuelans since the nation-wide food shortage. According to Reuters, the average Venezuelan lost 24 pounds (11 kilos) in 2017 as a result of the economic crisis and food shortage. We were able to find almost all of the shelters on this map, and have met some true refugee heroes – people who have quit their jobs to make 200-300 meals a day, people who have opened their own homes for refugees to sleep in, people who are watching for the most vulnerable walkers and buying them bus tickets over the pass. Most of the shelters are run by a church or a small foundation. There is only one large NGO present – Samaritan’s Purse – and they run the two largest shelters. These shelters offer much-needed respite, albeit brief. All the shelters are one-night only. Walkers have to keep walking because the next day will bring another flood of people to fill capacity again. After all, the journey is long, and this stretch is only the beginning.